Just click the button and the project will be archived, making it inaccessible to you as well as anyone who has a share-link to the project. Should anyone click on a link to an archived project, they’ll be greeted by our friendly T-Reqs mascot letting them know that the project has gone extinct. Accidentally delete the wrong project? No worries; when you click the archive button, you are immediately given the option to undo. Or, if you decide later on that you want the project back, you can unarchive it from your account page. In addition, if you upload the project again from CaseComplete, it will automatically be unarchived. Can Everything be a Top Priority? At many points during your project, you'll need to answer some tough questions: We can’t implement all of these use cases, so which ones are top priority? Which of these UI wireframes is best? 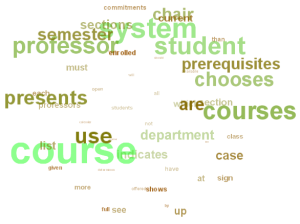 Which requirements can we defer until later? Our latest feature lets you poll your stakeholders to get their opinions on these questions and more. A poll for developers that asks, “Which use case would take longer to implement?”. You’ll get a rough estimate for complexity that can aid in project scheduling and estimation. A poll for Business Analysts that asks, “Which use case is easier to understand?”. It might be the case that the lower ranking use cases could use some rewriting or refactoring to aid comprehension when you present them to your developers or end users. A poll for your QA team that asks, “Which requirement is more difficult to test?”. You might want to set up test harnesses for those requirements right away. After setting the question, click Add Items to select the items you want people to vote on. Choose a small subset of your items – this will make it easier on your voters (more on that later). Two great things about this approach…First, voters only need to consider two items at a time, greatly simplifying their decision. No time is spent trying to make nuanced decisions, for example if a particular use case is a medium or medium-high priority. And second, voters are forced to make a decision – there’s no way to mark everything as high priority despite their desire to do so. It’s probably clear now why I said it’s best to keep your polls small. The number of pairings grows quickly as you add items to the poll. For example, a 10 item poll will have 45 pairings. A lot to be sure, but keep in mind that voters don’t have to vote in one sitting, and they can use their mobile device to vote anywhere and anytime, such as during commutes on the train, or in the dentist’s waiting room. This data is most useful as guidance and to spur further discussion; it shouldn’t be used to make decisions for you. For example, from the graph above it’s a pretty safe bet that creating a loan account is higher priority than evaluating a loan application, but it gets a little fuzzy in the middle. And if all your items are closely ranked, then it’s a good indicator that your project stakeholders have a lot of competing interests and cutting a particular feature will surely disappoint someone! Want to give it a try? Try our sample just-for-fun poll so you can see firsthand how it works. You can check the results any time if you’re curious to know how the poll turns out. As I mentioned earlier, this is just the first polling approach that we have planned. Does your organization have a favorite voting technique that you’d like to see us implement? If so, let us know! One of the big ideas behind Requirements.cc is the ability to share your requirements with others in a really low-friction way. It should take just a click or two and the recipient should be able to see what you’re sharing with the click of a link – whether they’re using a computer, phone, or tablet. You can share whatever you happen to be viewing: a use case, a diagram, a list of requirements, etc. To share something, just click the share button. We had to balance the goal of simple sharing with the need to keep your requirements reasonably secure. One way we did this was to have the links expire automatically in three days. This frees you from having to remember to disable the link and, if the link would eventually make it into the wild, it would become invalid quickly. When you edit the link, you’ll not only be able to change its expiration, but you can assign it a password, too. Anybody who clicks the link will be asked for the password before they can click through. Finally, as Doug pointed out in the previous post, when a viewer follows your share link, they’ll be able to browse to other items in the same project, but not items outside of the project. So you can set up different projects for different groups (e.g. customers) and they’ll be limited to viewing only items in the project that you sent them. I’m pretty excited about what we’ve done with sharing so far and I hope we’re striking the right balance between security and ease of use. Let me know what you think. Upload a project and share a link, then let me know what you think of the experience. What’s missing? Last week I wrote about how you can view and compare versions of your requirements and use cases. But how can you find out which items have changed without looking at each one individually? Yesterday we released a feature that allows you to do just that. We’ve added a Frequently Changed section to the Items page which shows the 5 items with the most updates. This lets you see the “hot spots” in your project, those requirements and use cases with the most churn. At the bottom of this list, there is a link to view all changes. 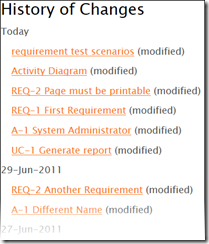 The resulting page shows the changes made to your project, organized by date. 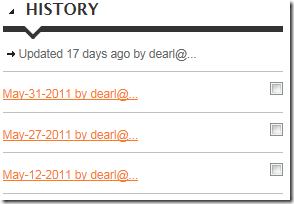 Currently it shows when an item has changed or been added, and soon, we’ll also show deletions. When you click on an item, it will use the aforementioned comparison feature to highlight the changes made to the item on that date. We think this will be a pretty useful feature, but as always we’d like to hear what you think, especially regarding your anticipated use of Requirements.cc. Will you upload your project frequently and ask for reviews often? If so, the change history will let your reviewers focus on the items that changed since their last review. Or, will you upload just once in a while, where nearly every item in the project has changed? Then perhaps the change history won’t be so useful, since each date will essentially be a list of your entire project. So beta testers, what do you think? Please let us know. If you haven’t uploaded your project recently, go ahead and upload it again and see what’s new! 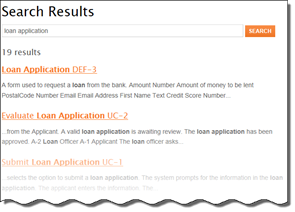 You’ve probably noticed the History section when viewing your use cases and requirements. But until you upload your project multiple times, you won't see its full capability. So let’s take a quick look at this feature so you can see what it’s all about. 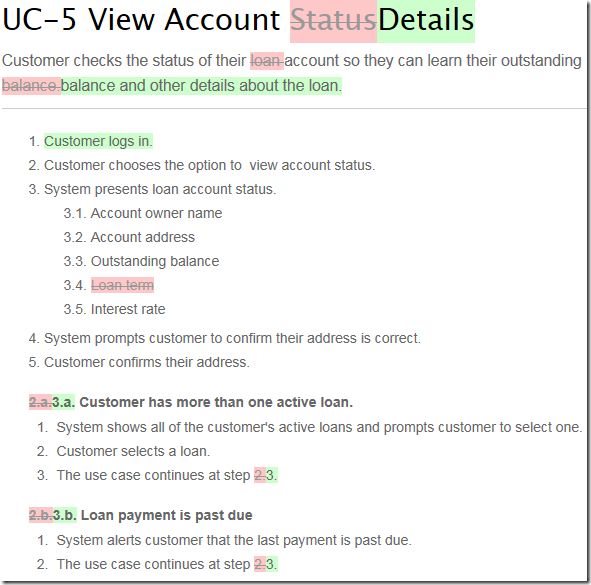 Here you can see that the name of the use case changed, some text was deleted, (red strikethrough text), and some text was added (green text). And because a step was added, the extension numbers changed. We hope you’ll find this to be a useful feature. Give it a try and let us know what you think! 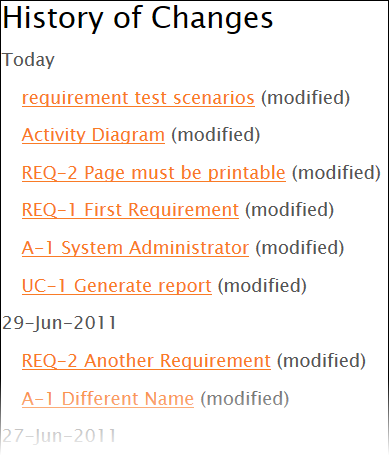 Make sure you have the most recent version of CaseComplete 2011. You can get the latest via Tools / Check for Updates. 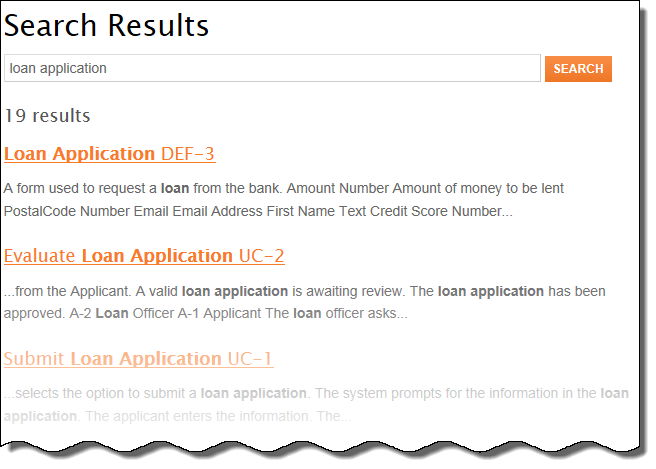 Note that you’ll only need to perform this step once, and after we’ve officially launched, you won’t need to do it all. Open a project you’d like to upload and click the Publish to Web button. Provide the email and password you used in step 1. 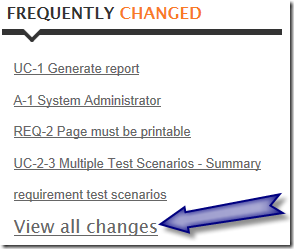 Version tracking (by making changes in CaseComplete and republishing your project). We’re eager to hear your feedback. Keep in mind this is beta software, so if you encounter any problems or have ideas for features or improvements, please send them our way. You’ll find this feedback link on many of the pages of the site, so feel free to send suggestions as you think of them.